[PDF] Mechanics and Thermodynamics (Undergraduate Lecture Notes in Physics) | Free eBooks Download - EBOOKEE! Description: This introduction to classical mechanics and thermodynamics provides an accessible and clear treatment of the fundamentals. Starting with particle mechanics and an early introduction to special relativity this textbooks enables the reader to understand the basics in mechanics. The text is written from the experimental physics point of view, giving numerous real life examples and applications of classical mechanics in technology. This highly motivating presentation deepens the knowledge in a very accessible way. The second part of the text gives a concise introduction to rotational motion, an expansion to rigid bodies, fluids and gases. 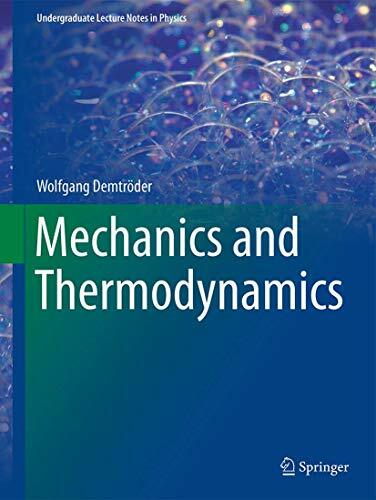 Finally, an extensive chapter on thermodynamics and a short introduction to nonlinear dynamics with some instructive examples intensify the knowledge of more advanced topics. Numerous problems with detailed solutions are perfect for self study. No comments for "[PDF] Mechanics and Thermodynamics (Undergraduate Lecture Notes in Physics)".